We had representatives from the DfE, all the major exam boards, the IB, Whole Education, the ModBacc, the Heads’ Roundtable, the Institute of Education and lots of schools and colleges. We also had input from Mike Hatcher who runs the Welsh Bacc (they are way ahead of us! ). The turn-out was magnificent and, after the presentations, the feeling amongst the gathering was very strong that we had enough common ground to press forward with some confidence and that we should go for it, regardless of the outcome of the General Election. So that is what we’re going to do. Setting up a National Baccalaureate Trust; we need to establish an organisation that can run the National Bacc for real, securing funding and employing people to deal with public awareness and promotion and the accreditation itself. We will need to ensure that we recruit trustees who can give the Trust the full credibility needed for a national body – people from HE, CBI and possibly the Exam Boards? Seeking sponsors and/or funding sources so that the National Bacc Trust can function on more than a shoestring. Arranging further Summits for later in March and again in June – in North/South venues – where we can begin to recruit providers and get the idea off the ground. These summits will be an opportunity for people to contribute to shaping the language of the National Bacc’s core values and to thrashing out some of the parameters. So – we have a plan! Watch out for details. Meanwhile, it may be worth re-stating what the basic elements of what a National Baccalaureate could be. 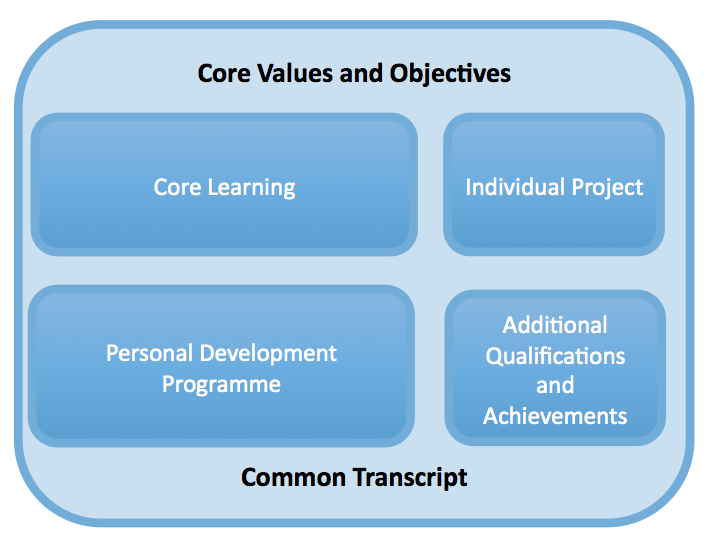 The driving purpose is to create a framework that gives value to the full range of every young person’s educational experiences and achievements and generates incentives for all providers to deliver a curriculum entitlement for all learners, leading to full Baccalaureate accreditation at an appropriate level. At our summit, we agreed that these were all uncontroversial, key components. Further work over time is needed to establish the parameters of each element. The IB, ModBacc and our HTRT model all fit within this broad umbrella. Our thinking was that, by keeping it broad, we will gather momentum and, over time, the model might tighten up as a consensus develops around specific details. One major area for discussion will be around the core values and objectives. The IB, for example, has a strong mission statement and a 10-point Learner Profile that permeate the various programmes they offer. The Welsh Bacc has something similar. Our English National Curriculum has a rather bland core statement of intent – I think we’d need something more profound to drive the Bacc. If every learner left school with a record of their achievements that looked the same – but was uniquely their own and could be accessed online at any time – then I think we’d have moved a long way forward. The examined components matter a great deal – there’s an argument for giving Maths and English higher profile but, overall, the results will speak for themselves. 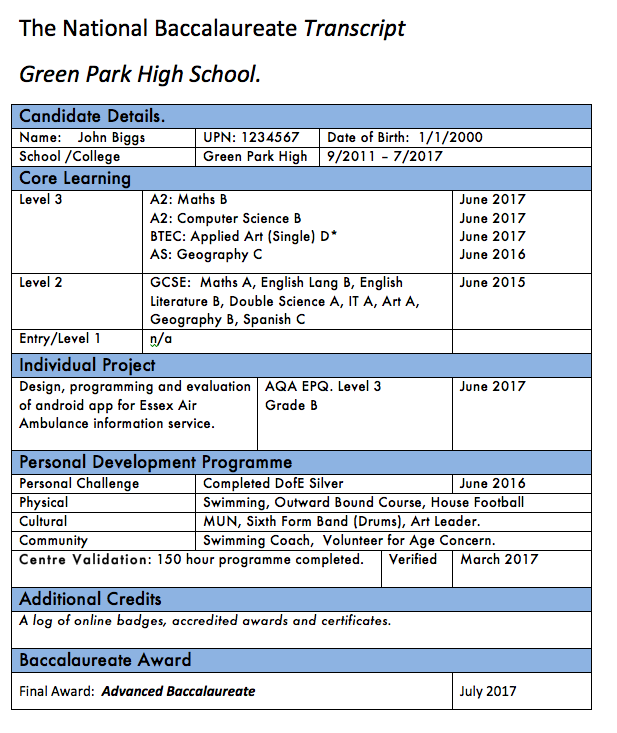 However, they are set in the context of a wider set of achievements including the details of the Personal Development Programme. The final award would depend on completion of the minimum requirements but, even without that final level of accreditation, the transcript works to give a much broader sense of a person’s education. Importantly, with this system in place, there would be massive incentives for students (and their providers) to work towards completing their Bacc Transcript by engaging in a wide range of activities and educational endeavours. 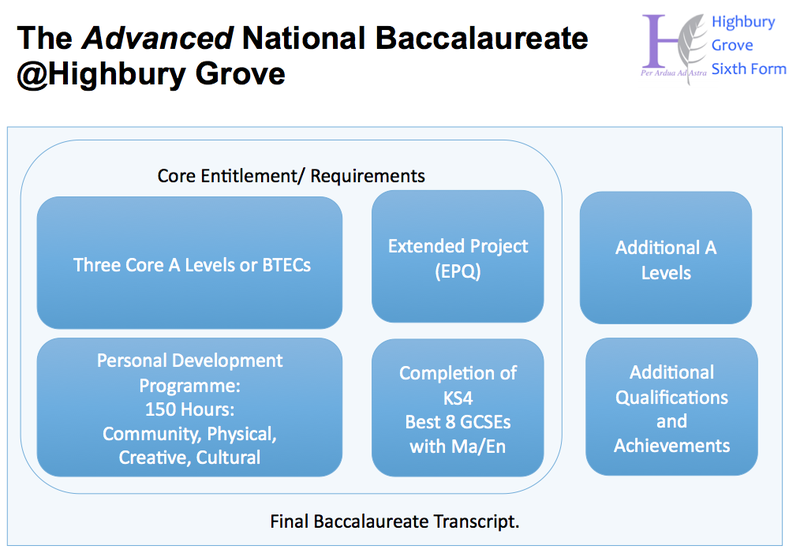 Once we have the National Baccalaureate Trust up and running, the idea is that schools and colleges would apply for accreditation for their Bacc provision. We’re not sure how people would join or affiliate – all of that is still to come – but it is on the way! I will update this post after January 6th and keep everyone informed of progress. Following our meeting, we’re going forward, full-steam ahead. We feel that the time is right, the political landscape is right and the level of consensus makes it more or less unstoppable. This event will give all participants an opportunity to shape articles of the National Bacc Trust and to agree the broad terms of the umbrella Bacc model, along the lines sketched out above. Following this meeting, the National Bacc Trust will be brought into being. We will then form a Board of Trustees, seek funding and appoint the personnel needed to put our ideas into action. 2. National Bacc Convention: Putting the Ideas into Practice. June 25th – London, details to be confirmed. This event will be bigger; we’ll be inviting schools, colleges, exam boards, UCAS, DofE, the CBI, National Citizen Service – and all providers of significant personal development opportunities, qualifications and accredited awards. 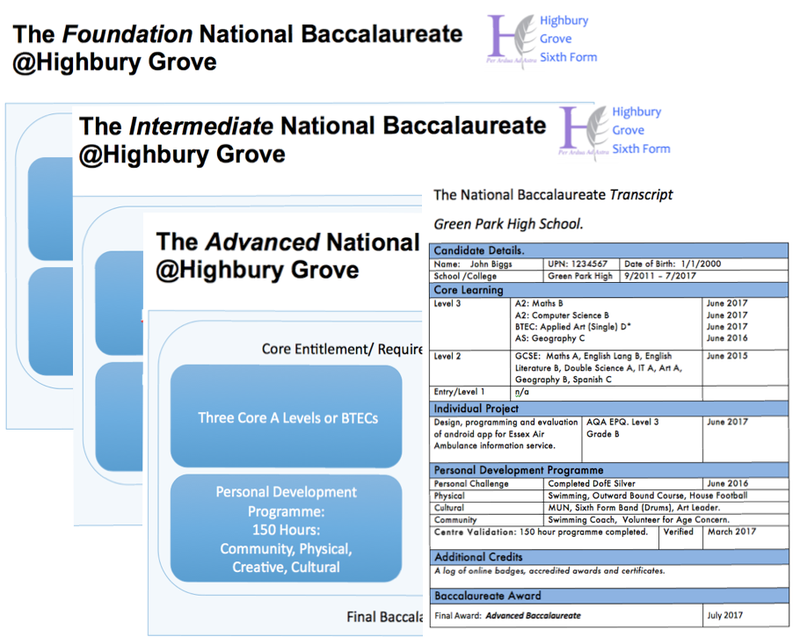 We want people interested in developing the National Baccalaureate at Entry and Foundation level for Secondary, at Primary Level and at Middle School Level so that we can begin a top-to-bottom framework for England that celebrates and rewards educational breadth and personal development alongside excellence in technical and academic learning. Save the date! Sign-up details will be published in due course via a website that hasn’t been set up just yet. « OfSTED Outstanding? Just gimme some truth.